Herzog College, an affiliate of Yeshivat Har Etzion, has played a leading role for over 30 years in training outstanding Jewish educators from among the religious Zionist community. Herzog College, established with the vision of providing young Hesder students with the knowledge and skills to become capable, caring and charismatic Jewish educators, is helping to train the next generation of Jewish educators, both men and women, for Israel and worldwide. Dr. Shmuel Shilo assumed the position of director of Herzog College at the beginning of the current academic year, replacing outgoing director Dr. Shmuel Wygoda. Born in the United States, Dr. Shilo came on aliya at an early age, and today lives in Jerusalem and is married with five children (two of whom live in Efrat, including Rahel and Yehoshua Berlin, the Yeshiva's well-known carpenter). Dr. Shilo studied at Merkaz Harav Yeshiva and holds a doctorate in law from the Hebrew University in Jerusalem, where he is now Professor Emeritus. 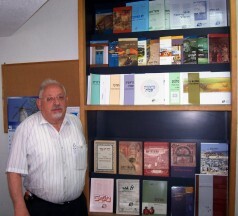 His specialty is Jewish Law and Israeli Law and he continues to teach Seminars at Hebrew U. on a voluntary basis. As the largest of the religious teachers' colleges today, numbering a total student body of 1,219, Dr. Shilo insists that, "We are objectively and subjectively the best." He notes the excellent staff of Herzog College, both administrative and educational, and says, "There is an extraordinary feeling here of being part of an institution where everyone feels a commitment to contribute way beyond the call of duty." He explains that the approach is an open, intellectual one – there is no censorship of minds – while the Roshei Yeshiva guide the College in all areas, from the appointment of new staff members, to the development of new programs, etc. This year, two new programs have been approved by Israel's Council for Higher Education – a Master's Program in Tanach and a Bachelor's Program in Hebrew Literature (both for men and women in separate classes), slated to begin in September 2008. The existing programs in Tanach, Toshba (Oral Law), Machshevet Yisrael, Limudei Eretz Yisrael and Hebrew Language continue to grow and develop. Master's Programs in Machshevet Yisrael and Toshba are currently in the advanced stages, as well as a new program to train teachers for Special Education. Other programs being developed focus on Theatre and Cinema and on Jewish History. A new and sorely-needed program began this year, coordinated by Rabbi Matanya Ben Shachar, a Har Etzion alumnus and Rav of Neve Daniel, training future teachers and Ramim to implement a course in yeshiva high schools on "Adolescence and Family Life". As part of the program, doctors, psychologists, noted educators, and other guest lecturers are invited to share their expertise with the teacher trainees. A similar program is being planned for the pedagogic program of the Stella K. Abraham Beit Midrash for Women in Migdal Oz scheduled to open in September 2007. A very successful Employment Fair was held for the first time at Herzog College in March, attended by school principals from throughout the country, affording the opportunity for those looking for teaching positions to meet with principals and find out what jobs are available. The Spiritual Leadership Program for Ethiopian hesder graduates continues to flourish and many graduates of the program are today serving as rabbis, teachers and community leaders for the Ethiopian community in various locations throughout Israel. Another program - "Eshkolot" - for specially gifted students with high psychometric exam scores, enables participants to complete the regular 4-year program in only 3 years. Students accepted to the program receive a partial grant, and the remainder of the tuition is given as a loan which becomes a grant if the student fulfills a prior commitment to teach for 3 years upon graduation. This Ministry of Education program aims to attract promising young students to the field of Jewish education. In line with the general trend of "academization" in the field of education, the number of Herzog College faculty holding doctoral degrees in their respective fields has jumped from 9 in 1995 to 32 today, with many more holding Master's degrees and working towards their doctoral degrees. There are approximately 100 educational staff members in Herzog College, including both full-time and part-time lecturers. Herzog College runs special Study Seminars on various topics throughout the year, attended by hundreds of participants each time. This year, there were Seminars on the topic of the Hashmonaim (during Chanuka), Chassidut, and Michal bat Shaul, launching two new books on Tanach by staff members, Harav Amnon Bazak and Dr. Jonathan Jacobs, published by Herzog College's Tevunot Publishing House. Tevunot continues to publish many sefarim by rabbis and teachers as well as its regular journals, Megadim (on Tanach), Al Atar (Limudei Eretz Yisrael) and Netuim (Torah She'be'al'pe).